Reading and share top 3 famous quotes and sayings about Unused Potential by famous authors and people. Browse top 3 famous quotes and sayings about Unused Potential by most favorite authors. 1. "For many have but one resource to sustain them in their misery, and that is to think, "Circumstances have been against me, I was worthy to be something much better than I have been. I admit I have never had a great love or a great friendship; but that is because I never met a man or a woman who were worthy of it; if I have not written any very good books, it is because I had not the leisure to do so; or, if I have had no children to whom I could devote myself it is because I did not find the man I could have lived with. So there remains within me a wide range of abilities, inclinations and potentialities, unused but perfectly viable, which endow me with a worthiness that could never be inferred from the mere history of my actions." 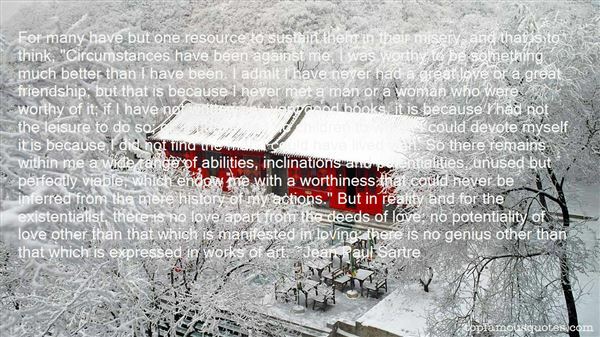 But in reality and for the existentialist, there is no love apart from the deeds of love; no potentiality of love other than that which is manifested in loving; there is no genius other than that which is expressed in works of art." 2. "On this subject it is striking to note how many individuals pursue, outside of their own professions and with a kind of rebellious delight, hobbies that are no more than personalized forms of work. 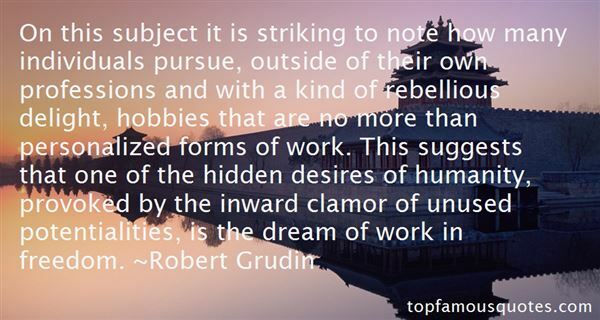 This suggests that one of the hidden desires of humanity, provoked by the inward clamor of unused potentialities, is the dream of work in freedom." 3. 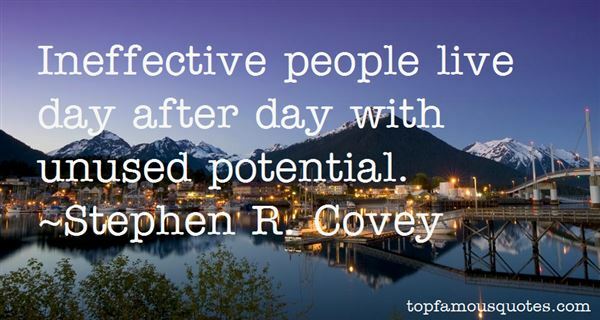 "Ineffective people live day after day with unused potential."